A Drag Chain Conveyors is a conveyor in which the open links of a chain drag material along the bottom of a hard-faced MS or SS trough. Overhead Chain Conveyor System 150mm pitch / 300mm pitch and Heavy Duty 200mm Pitch complete with Track, Chain, Bends, Take up, Cater Piller drive unit / Sprocket drive unit. 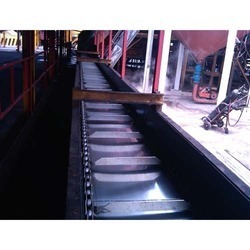 Broad range of superior quality Slat Conveyors is offered by us. These are used in various industries for handling of bulky and heavy material from one place to another. Our range of product is made from high quality stainless steel. We offer these to our client at market leading prices and as per the specification of our respected clients. Slat conveyor is perfect for gently and quietly transporting product. 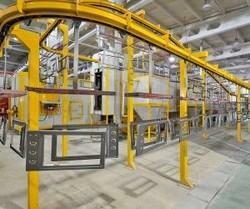 This conveyor requires very little maintenance and will transport products over short or long distance. It is designed for conveying the heavy materials. Body Material: MS / SS-304 / C-45 / BQ etc.